There are many ways to manage stress but without a solid spiritual connection, those ways are just surface fixes. You must know who you are, and what your life is about to live a life of ease and peace. As a mother, you give and give. You are the caretaker of those around you and while this can be extremely satisfying, it can also deplete you. When you become so busy that you make compromises of yourself, your very nature, you begin to erode that which you bring to others–your love, your beauty, your excitement. It is as if you have spiritual credit card debt. And, as you can imagine, spiritual credit card debt is stressful. 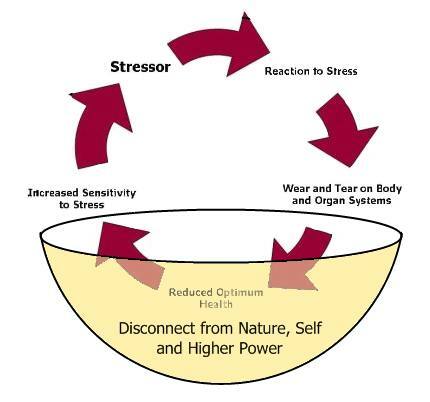 Stress is a cycle which move from stressor to stress response back to stressor. The bowl in which this cycle sits is your disconnect from self, from God, and from Nature. If you stay connected with self, God and Nature, the stress cycle never gains momentum. You make choices which nourish you, you receive strength from the Universe, and you rarely get so busy that you can’t remember why you are doing all your activities. 1. Break the stress cycle where you can. Relieve your symptoms of stress–do what you need to reduce headaches, settle your stomach, get some sleep. If your head hurts, you can’t meditate, so first get the symptoms under control. Take care of your body–Begin, slowly and gently, to do the things that you know are good for you. Eat well, exercise, sleep. You must reduce cortisol, and increase serotonin for your body to have the capacity to find quiet. Watch your reactions–observe your reactions to stressors and whether they are appropriate for the situation. Are you overreacting? Is there some other way to respond to the stressors in your life. Start by simple observation. Don’t try to “fix” yourself, just observe what is happening. Observation alone is a great way to manage stress. 2. Look for grace. Keep an eye out for little miracles. 3. Find quiet. God talks when we listen. But its more like a whisper than a shout. Find quiet so you can hear. 4. Do that which makes you feel close to God. Put yourself in the environment where you feel God, and if you don’t feel Creator now, go where you remember you used to feel sacredness. If you go to church, go back to church and just sit. Go to your most sacred places and sit. 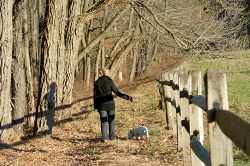 One of my ways to manage stress and feel close to the Divine is to walk in the trees. I have had many sacred moments among trees. When I am in tune with the Divine, I feel a light moving through me. I am expansive and without borders. For others, God is a presence nearby. The ways to manage stress spiritually include finding opportunities to feel God. 5. God is the Creator so do “creative” things. Find passion again. 6. Remember what you love. For mothers, loving our children can reconnect us to the Divine. But don’t forget to love nature, love life, love your partner. Being in love can reduce stress. 7. Find a trusted person or persons to support your desire to reconnect. This person could be a priest, minister or friend or grandmother. Talk about the sacred. Remember it. Discuss ways to manage your stress spiritually. 8. Remember when you used to be connected and make it a practice to remember that every day. When stress approaches, recall that peaceful time and imagine actually being there. Remember the trust you had. Remember how protected you felt. 9. Mindless to mindfulness–Practice being fully present and mindful. Give yourself the assignment of being mindful for 1 day, 1 hour or 1 minute. Really be present. Observe yourself and the events around you and fully participate with your heart. 10. Choose to change your patterns–Make a choice to find yourself again, but make that choice like an open window catching a breeze. Don’t force it, don’t make a “to do” list, don’t stress about it. The best ways to manage stress don’t involve creating more stress. 11. Pray. Meditate. Take time to talk to your Higher Power. 12. Be grateful–Remember to say thank you everyday for the gifts you have. When you reconnect with your self, nature and your Higher Power, the ways to manage your stress naturally appear. When we are connected to the Divine, there is such a vast reservoir of help and support that our little human worries seem inconsequential. They drop away. We feel stress when we take on the world as a human and try to put our will against it. When we give in to our inability to use our will, and use the Divine instead, our struggle ceases. Plus, as people who remember our true nature, we make choices which nurture us and don’t deplete us. Materialism drops away and we can truly decide if we are living a full life, a life worth living or just spinning our wheels. Don’t be surprised if, during the process many changes take place. But don’t worry if they don’t. In either case, you are realizing you purpose and your life will become meaningful and not stressful.